SLICING WHEEL FOR URSCHEL Translicer Model TRS-2500 / TRS-2510; --Urschel assembly number 51203. 22 blade slice wheel assembly manufacturer specified for 1/8 inch (3.2mm), and (with 11 blades) 1/4 inch slices (6.4mm). Series 275 on wheel/belt speed chart. 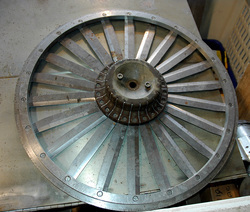 As of this writing this Translicer cutting wheel assembly is in stock in good condition, available for timely shipment. This page contains a single entry by Michael C. Shults, Alard Equipment Corp published on August 26, 2013 12:26 PM. y1667 was the previous entry in this blog. z9537 is the next entry in this blog.